MUMBAI, April 3 (Reuters) - Indian soyoil futures eased on Friday afternoon on profit-taking triggered by weakness in rival Malaysian palm oil and soyoil on the Chicago Board of Trade (CBOT), but firm demand limited the losses. At 1:44 p.m. (0814 GMT), the April contract NSOJ9 was down 0.58 percent at 458 rupees ($9.1) per 10 kg on the National Commodity and Derivatives Exchange. The May contract NSOK9 eased 0.15 percent to 460 rupees after falling nearly four percent in two sessions. At 0814 GMT, the benchmark June palm oil contract KPOc3 on the Bursa Malaysia Derivatives Exchange was down 0.32 percent at 2,152 ringgit a tonne. The contract had earlier risen to a new high at 2,184 ringgit a tonne. July soyoil futures BON9 on CBOT was down 0.79 percent at 35.10 cents per pound during the electronic trade on Friday. However, the losses were limited on good domestic demand and forecast by United States Department of Agriculture of a lower-than-expected soy plantng by the U.S. farmers. April 3 (Bloomberg) -- The yen weakened to above 100 per dollar for the first time in five months as the Group of 20 nations pledged more than $1 trillion to revive global economic growth, sapping demand for Japan’s currency as a refuge. The yen also fell to a five-month low against the euro and the Australian dollar as stocks rallied, increasing demand for higher-yielding assets. The euro is poised for a weekly gain against the dollar on speculation a European Central Bank official will signal the bank is done cutting interest rates after yesterday lowering them by less than economists expected. The yen touched 100.18 per dollar and traded at 99.90 as of 9:56 a.m. in Tokyo, after falling 1 percent yesterday. Japan’s currency weakened to 134.40 per euro, from 133.98 late yesterday in New York, when it dropped 2.6 percent, the most in five weeks. The yen is set for a 3.3 percent slide versus the euro this week. Europe’s single currency was little changed at $1.3456 after advancing 1.6 percent yesterday and has gained 1.3 percent this week. Australia’s dollar rose to 72.26 yen, after reaching 72.33, the highest since Oct. 21, as a report showed the nation’s services industry shrank last month at a slower pace. The New Zealand dollar advanced to 58.94 yen, after reaching 59.03, the highest since Nov. 10. Asian stocks jumped, with the regional benchmark index headed for its fourth weekly advance, as world leaders agreed on measures to fight the global recession and manufacturing grew in China. That followed a rally yesterday in U.S. stocks which pushed the Dow Jones Industrial Average above 8,000 for the first time since Feb. 10. Policy makers also called for stricter limits on hedge funds, executive pay, credit-rating firms and risk-taking by banks. They tripled the firepower of the International Monetary Fund and offered cash to revive trade to help governments weather the turmoil resulting from the surge in unemployment. The VIX volatility index, a Chicago Board Options Exchange gauge reflecting expectations for stock price changes that’s used as a measure of risk aversion, fell 0.6 percent yesterday, the third day of declines. The euro gained against the yen as European policy makers cut the target lending rate by a quarter-percentage point to 1.25 percent, compared with a half-point reduction expected in a Bloomberg survey. Benchmark rates are 0.1 percent in Japan, 0.5 percent in the U.K. and between zero and 0.25 percent in the U.S.
“Interest-rate differentials between the euro zone and other nations such as the U.S. are still favorable for the euro,” said Masanobu Ishikawa, general manager of foreign exchange at Tokyo Forex & Ueda Harlow Ltd., Japan’s largest currency broker. “This makes it easy to buy the euro,” which may rise to $1.3550 and 135.00 yen today, he said. ECB President Jean-Claude Trichet indicated at a press conference in Frankfurt following the decision that the economy should “increasingly benefit” from the measures the central bank has taken. Executive Board Member Lorenzo Bini Smaghi last month said European interest rates are lower than those in the U.S. when making a comparison of real inter-bank lending, adding to the argument against further reductions in the benchmark. He speaks at 11 a.m. in Rome. Declines in the yen may be limited before a U.S. Labor Department report shows the world’s biggest economy lost more than half a million jobs for a fifth month, reducing the appeal of the greenback. “There’s a risk of position adjustments before the U.S. labor report, which may prompt buying back of the yen,” said Masafumi Yamamoto, head of foreign-exchange strategy for Japan at Royal Bank of Scotland Group Plc in Tokyo and a former Bank of Japan currency trader. U.S. employers probably eliminated 660,000 jobs last month, following a reduction of 651,000 in February, according to the median forecast of 80 economists surveyed by Bloomberg. The Labor Department is scheduled to release the report at 8:30 a.m. in Washington. The Dollar Index, which the ICE uses to track the greenback against the euro, yen, pound, Canadian dollar, Swiss franc and Swedish krona, decreased 0.3 percent to 84.224, and is poised for a 1 percent weekly decline. April 3 (Bloomberg) -- Crude oil fell, paring yesterday’s 8.8 percent rally, after the head of the International Energy Agency said the group is likely to cut its energy demand forecast on declining economic growth projections. There is a “high probability” of a downward revision in the IEA’s next monthly report, due on April 10, Executive Director Nobuo Tanaka said yesterday in an interview with Bloomberg Television. Crude oil for May delivery fell as much as 58 cents, or 1.1 percent, to $52.06 a barrel on the New York Mercantile Exchange and traded at $52.12 at 11:18 a.m. Sydney time. Oil rose $4.25 to settle at $52.64 a barrel yesterday, the biggest increase since March 12, as leaders of the Group of 20 nations met and announced plans to combat the global recession. Tanaka spoke before the talks ended. “There’s nothing bullish in the fundamentals in the near future,” said Raymond Carbone, president of Paramount Options Inc. and a Nymex trader. He said oil gained “on hope” yesterday as the G-20 met. Reports showing rising oil inventories and falling demand signal that the worst of the recession may not be over. U.S. crude supplies climbed 2.84 million barrels in the week ended March 27 to the highest since July 1993, the Energy Department reported April 1. Gasoline stockpiles rose by 2.23 million barrels to 216.8 million. World oil demand this year will average 84.4 million barrels a day, the IEA said last month. Oil surged yesterday after the G-20 agreed on measures to fight the global recession at a meeting in London. The G-20 said it will implement new rules on compensation and bonuses, expand controls on hedge funds and pledge more than $1 trillion in emergency aid to cushion the economic fallout. The G-20 nations will channel $850 billion to the International Monetary Fund and World Bank. They also offered cash to revive trade to help governments weather the economic and social turmoil. They sidestepped the question of whether to deliver more stimulus in their own economies. Stocks rallied around the world yesterday, driving the MSCI World Index higher for a third day, as some reports suggest the pace of economic decline may be easing. The Standard & Poor’s 500 Index increased 3.7 percent to 840.95. The Dow Jones Industrial Average rose 3.6 percent to 8,037.98. Prices have rebounded this year as the Organization of Petroleum Exporting Countries cut production. The group reduced daily output targets by 4.2 million barrels since September to prevent a glut and bolster prices. OPEC cut oil output by 1.2 percent to an average 27.395 million barrels a day last month, according to a Bloomberg News survey. The 11 OPEC members with quotas, all except Iraq, pumped 25.06 million barrels a day, 215,000 more than their target of 24.845 million. Oil prices “have bottomed out now and we hope they will improve, even though fundamentals are really the same,” OPEC Secretary-General Abdalla El-Badri said yesterday before the Paris oil conference. Goldman Sachs Group Inc. said Brent crude oil prices may reach $50 a barrel this year, up from an earlier estimate of $45, because of OPEC production cuts. Brent crude oil for May settlement rose $4.31, or 8.9 percent, to end the session at $52.75 a barrel on London’s ICE Futures Europe exchange. April 2 (Bloomberg) -- Gold fell the most in more than a week on speculation that the world economy will improve, eroding the appeal of the precious metal as a haven. Silver gained. Global equity indexes rallied as Group of 20 leaders met to discuss economic stimulus plans amid mounting evidence the worst of the recession may be over. Manufacturing in China increased last month and home prices in the U.K. rose. Investment in the SPDR Gold Trust, the biggest exchange-traded fund backed by bullion, has been unchanged since March 27. Gold futures for June delivery fell $18.80, or 2 percent, to $908.90 an ounce on the Comex division of the New York Mercantile Exchange, the biggest drop for a most-active contract since March 24. The Standard & Poor’s 500 Index of equities jumped as much as 4.3 percent and the MSCI World Index climbed for a third straight day. National leaders at the G-20 meeting agreed to a regulatory crackdown to rein in excesses and pledged more than $1 trillion in emergency aid to help ease the global recession. The summit produced a call for stricter rules governing hedge funds, executive pay, credit ratings and risks taken by banks. Gold’s losses accelerated after a U.K. official said the International Monetary Fund should consider selling its gold reserves to raise cash. International Development Secretary Douglas Alexander said there has been discussion with South Africa about the market effects of a “phased and appropriate sale” of some IMF bullion reserves. In April 2008, the Washington-based lender’s executive board approved a plan to sell 403.3 metric tons of bullion to help close an annual budget deficit. President Barack Obama’s administration soon will push Congress for legislation that allows the IMF to “mobilize” its stockpile of gold to boost its funds, Treasury Secretary Timothy Geithner said on March 11. A move to sell gold must be supported by 85 percent of the lender’s executive board, and will require legislative action in most member countries, the IMF said in April 2008. The board representative from the U.S. needs congressional approval to vote in favor of any sales, the IMF said. “The mere mention of the possibility of IMF gold sales making the rounds at the G-20 today is pressuring gold prices,” said Ralph Preston, a commodity analyst at Heritage West Futures Inc. in San Diego. A drop below $890 may trigger more selling, he said. The IMF is the third-largest holder of gold reserves after the U.S. and Germany, according to the producer-funded World Gold Council. On its Web site, the lender says it has 3,217 metric tons (103.4 million ounces) in bullion deposits. “You’ve got the IMF selling gold -- maybe it’s not a lot, but psychologically it would weigh on the market,” Prospector’s Kaplan said. Silver, which has wider industrial applications than gold, rose on speculation that growth will spark demand for raw materials. The Reuters/Jefferies CRB Index of 19 commodities climbed as much as 3.1 percent, paced by gains in crude oil, gasoline and nickel. Silver futures for May delivery gained 5 cents, or 0.4 percent, to $13.025 an ounce. Gold has climbed 2.8 percent this year while silver has risen 15 percent. FKLI April futures contract surge 33 points higher to close at 913 as compare to previous trading session with total 10706 lots traded in the market. FKLI surge up throughout the entire trading session as regional indices and Dow Jones electronic trading traded higher during trading session. Technically, FKLI surge up fierce throughout trading session and stopped around 78.6% Fibonacci projection levels at 914 regions. We expect FKLI would trade higher in the coming trading session. 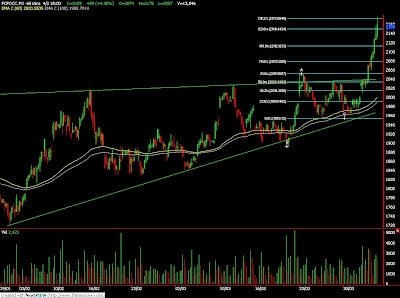 However, FKLI might retrace slightly towards support levels at 894 and 882 regions as market seems extremely overbought. 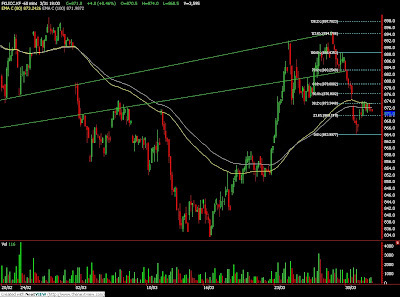 Traders were advice to hold long position around the support levels while be extra cautious around resistance levels at 925 and 942.5 regions. FCPO 3rd month June Futures contract surge RM89 higher to close at RM2159 as compare to previous trading session with 13846 lots traded in the market. CPO price was traded higher throughout the entire trading session as crude oil and soybean oil electronic trading were trade higher during trading session. Technically, CPO price continue to surge up after break up from the upper trend line at RM2050 regions but seems encounter great selling pressure at 138.1% Fibonacci projection at RM2173 levels. We expect CPO price would trade high as riding on bull rally recently. However, we expect CPO price would retrace mildly in the coming trading session around support levels at RM2093 and RM2042 regions. Traders were advice to hold long position around support levels while be alert around resistance levels at RM2175 and RM2210. MUMBAI, April 2 (Reuters) - India's soyoil, soybean and rapeseed futures rose on Thursday morning tracking gains in Malaysian palm oil, which rose to fresh highs, analysts said. A lower-than-expected U.S. soy planting forecast also supported prices. However, expectations of higher edible oil imports and rise in local supplies weighed. At 10:39 a.m, May soybean NSBK9 on the National Commodity and Derivatives Exchange was up 0.15 percent at 2,374 rupees per 100 kg, while May soyoil NSOK9 was at 452.65 rupees per 10 kg, up 0.33 percent. June rapeseed futures NRSM9 were up 0.58 percent at 477 rupees per 20 kg. April 1 (Bloomberg) -- Cash bids for soybeans at export terminals near New Orleans narrowed their premium relative to futures on the Chicago Board of Trade as farmers in Brazil and Argentina increased sales, reducing demand for U.S. supplies. The so-called spot-basis bid, or premium, for soybeans in New Orleans was 51 cents to 52 cents a bushel above the price of May futures, compared with 50 cent to 54 cents yesterday, U.S. Department of Agriculture data show. The spread was down from 58 cents to 59 cents a week earlier. Soybean futures for May delivery were unchanged at $9.52 bushel. Yesterday, the price surged 5.3 percent, the most since Oct. 29. Exports by Brazil, the second-biggest soybean shipper behind the U.S., surged 88 percent to 2.64 million metric tons in March from a year earlier, the Trade Ministry said today in a report. U.S. farmers hold half of the soybean supplies left from last year’s harvest, which may limit improvement in basis levels without adverse weather affecting crops this year, said Tim Abel, a commodity risk consultant for Mid-Co Commodities Inc. in Bloomington, Illinois. U.S. inventories as of March 1 fell 9.2 percent to 1.302 billion bushels from a year earlier, the USDA said yesterday. Farmers held 657 million bushels, or 50 percent of the total, up from 41 percent a year ago. Farmers have been limiting sales as lower transportation rates are signaling ample supplies of barges. The cost of moving grain by river from Chicago to New Orleans has fallen in the past week by $1.27 to $14.39 per short ton (907 kilograms), the lowest since May 2007, USDA data show. Shipping from St. Louis fell $1 to $8.10 per short ton. Barge companies are running as much as 25 percent below breakeven, Abel said. April 2 (Bloomberg) -- China’s leaders, increasingly concerned about the nation’s $740 billion of U.S. Treasuries, are making it easier for trading partners and consumers to do business in yuan. The People’s Bank of China has agreed to provide 650 billion yuan ($95 billion) to Argentina, Belarus, Hong Kong, Indonesia, Malaysia and South Korea through so-called currency- swaps. More such arrangements are being planned so importers can avoid paying for Chinese goods with dollars, the central bank said. In Hong Kong, which has pegged the currency to its U.S. counterpart since 1983, stores from Park’n Shop supermarkets to jewelers accept yuan. Chinese officials are using the Group of 20 meeting, which begins today in London, to call for reducing the dollar’s role and the creation of a new global reserve currency. Premier Wen Jiabao has said he’s concerned that a weaker greenback will erode the value of China’s Treasuries as the U.S. tries to spend its way out of the longest recession since the 1930s. The yuan has risen 21 percent to 6.8343 per dollar since the central bank scrapped a fixed exchange rate in July 2005. China has limited its advance to 2.7 percent in the past year as a stronger currency made the nation’s exports less competitive at a time when the economy is growing at the slowest pace in seven years. Gross domestic product will expand 6.5 percent in 2009, from 9 percent last year, according to the World Bank. Wen said on March 13 that China, the world’s biggest holder of foreign exchange reserves, wants guarantees for the safety of its U.S. assets. The Fed last month announced a $1.15 trillion plan to buy Treasuries and mortgage-related bonds, boosting supply of the currency. The Dollar Index, which the ICE uses to track the greenback against the euro, yen, pound, Canadian dollar, Swiss franc and Swedish krona, rallied 18 percent in the past year. It dropped 2.9 percent last month as the Fed started buying Treasuries. PBOC Governor Zhou Xiaochuan asked the International Monetary Fund on March 23 to expand the use of so-called Special Drawing Rights, which are valued against a basket of currencies, and move toward a “super-sovereign reserve currency.” G-20 members Russia and Indonesia supported the proposal, which would reduce the volatility of reserves. China and its Asian allies will adopt a “mild approach” on the plan to avoid driving down the value of U.S. investments, said Lee Chi Hun, deputy director at Korea Centre for International Finance, a Seoul-based government research agency. “A rapid collapse in the dollar system will cause damage to those who hold the most dollar assets,” said Lee. The proposal is “a strong warning for the U.S. to protect the value of Chinese assets,” he said. The dollar made up 64 percent of the world’s $6.71 trillion foreign-exchange reserves at the end of last year, down from 64.4 percent in September and 72.7 percent in June 2001, IMF data shows. The yuan can’t be a reserve currency because it isn’t fully convertible. China, the world’s second-largest exporter after Germany, according to the World Trade Organization, is turning to other strategies to reduce its dependence on the U.S. currency. Bank of China Ltd., the nation’s largest foreign-exchange lender, has started trials for the yuan settlement program in Shanghai and Hong Kong, President Li Lihui said in Beijing last month. While China allowed the currency to be used for trading goods and services in December 1996, it had to be converted before cross-border payments were made. Controls on buying or selling yuan for investment are also being eased. The government said on Dec. 9 it will triple the amount of domestic securities that overseas funds can buy under the qualified foreign institutional investors program to $30 billion, without giving a timeframe. Indonesian companies will be able to buy Chinese goods using yuan for the first time after last month’s 100 billion yuan currency swap, Bank Indonesia Deputy Governor Hartadi Sarwono said yesterday in Jakarta. Hong Kong banks have been able to accept yuan deposits since 2004 and stores have increasingly welcomed payment in China’s currency since 2003, when a relaxation of visa controls led to a surge in the number of mainlanders visiting the city. FKLI April futures contract rebound 4.5 points higher to close at 872 as compare to previous trading session with total 7694 lots traded in the market. Wild trading session for FKLI price trading as price tested new low and new high during the trading session ignoring regional and Dow Jones electronic trading. 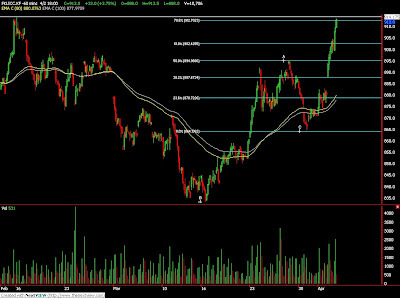 Technically, FKLI price seems manage to rebound 78.6% Fibonacci figure at 883 regions after supported above 50% Fibonacci levels at 864 regions. 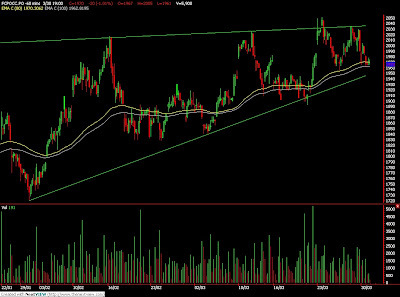 We expect FKLI would trade lower in the coming trading session provided resistance levels at 883 and 888.5 were not violated. 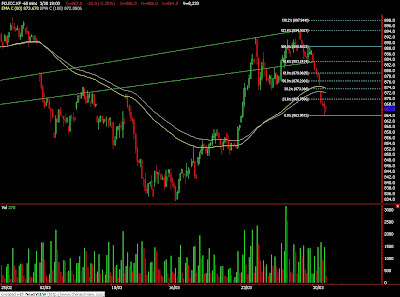 Traders were advice to hold short position in the coming trading session while be extra cautious around support levels at 873 and 864 regions. FCPO 3rd month June Futures contract surge RM70 higher to close at RM2070 as compare to previous trading session with 14116 lots traded in the market. CPO price surge up despite soybean oil and crude oil electronic were traded lower during the trading session. Technically, CPO price seems consolidating within RM2020 and RM2040 regions before manage to break up the upper resistance trend line around RM2045 regions. We expect CPO price would encounter strong selling pressure around resistance levels at RM2083 and RM2170 regions. Traders were advice to hold long position in the coming trading session provided is support levels around RM2030 and RM2000 must not be violated during the trading session. HAMBURG, March 31 (Reuters) - Global palm oil consumption will rise above output this season, cutting stocks and moving demand towards other edible oils, Hamburg-based oilseeds analysts Oil World forecast on Tuesday. Global Oct 2008/Sept 2009 palm oil consumption is likely to rise to 44.77 million tonnes, up from 41.22 million tonnes in 2007/08, it forecast. This would be above estimated 2008/09 production of 44.57 million tonnes, also up from 42.36 million tonnes in 2007/08. April 1 (Bloomberg) -- Oil fell below $50 a barrel, after capping its biggest monthly gain since May, on speculation that a government report today will show U.S. inventories rose from the highest level in more than 15 years as fuel demand slows. The industry-based American Petroleum Institute said yesterday that crude oil supplies rose last week to the highest since July 1993. Figures from the API and the U.S. Energy Department have moved in the same direction 75 percent of the time. The Bank of Japan’s Tankan index of sentiment among manufacturers fell to a record low of minus 58. Crude oil for May delivery fell as much as $1.38, or 2.8 percent, to $48.28 a barrel in electronic trading on the New York Mercantile Exchange. It was at $48.48 a barrel at 9:23 a.m. Singapore time. It has slumped 52 percent in the past year. Oil rose $1.25, or 2.6 percent, yesterday to $49.66 a barrel as equities increased and a weaker dollar enhanced the appeal of commodities. Crude gained 11 percent in the first quarter after tumbling 56 percent in the previous three months. Last month’s 11 percent increase was the biggest on a monthly basis since a 12 percent jump in May. The API report showed that crude oil supplies climbed to 357.8 million barrels last week. It also said that distillate stocks, including diesel fuel and heating oil, rose 1.78 million barrels, or 1.2 percent, to 144.5 million barrels, the highest since Jan. 12, 2007. The Energy Department is scheduled to release its weekly supply update at 10:30 a.m. today in Washington. The report is forecast to show that inventories of gasoline and distillate fuel, a category that includes heating oil and diesel, dropped. Brent crude oil for May settlement fell as much as $1.32, or 2.7 percent, to $47.91 a barrel on London’s ICE Futures Europe exchange. It was at $48.10 a barrel at 9:25 a.m. Singapore time. The contract rose 61 cents, or 1.3 percent, yesterday to $48.60 a barrel. April 1 (Bloomberg) -- Crude oil fell below $49 a barrel on speculation that a government report will show U.S. inventories rose from the highest level in more than 15 years. Supplies probably climbed 3 million barrels last week, according to the median of 11 analyst responses in a Bloomberg News survey. Stockpiles surged 3.3 million barrels to 356.6 million in the week ended March 20, the highest since July 1993 and 13 percent more than average for this time of year, according to an Energy Department report on March 25. “We are bracing ourselves for a build in crude stockpiles,” said Tim Evans, an energy analyst with Citi Futures Perspective in New York. The Washington-based American Petroleum Institute said after the close of trading yesterday that oil supplies rose by 3.28 million barrels to 357.8 million last week, the highest since the week ended July 16, 1993. Crude oil for May delivery fell 84 cents, or 1.7 percent, to $48.82 a barrel at 9:15 a.m. Sydney time on the New York Mercantile Exchange. It has slumped 52 percent in the past year. Oil rose $1.25, or 2.6 percent, yesterday to $49.66 a barrel as equities increased and a weaker dollar enhanced the appeal of commodities. Crude gained 11 percent in the first quarter after tumbling 56 percent in the previous three months. Last month’s 11 percent increase was the biggest on a monthly basis since a 12 percent jump last May. The Standard & Poor’s 500 Index increased 1.3 percent yesterday to 797.87. The Dow Jones Industrial Average rose 86.9, or 1.2 percent, to 7,608.92. The MSCI World Index of 23 developed markets rose 1.9 percent to 807.63. Last month’s gain of 7.5 percent was the biggest in almost six years. “Rallies are going to be limited until there are signs that inventories are being absorbed or the economic picture brightens,” said Gene McGillian, an analyst and broker at Tradition Energy in Stamford, Connecticut. The API report showed distillate stocks rose 1.78 million barrels, or 1.2 percent, to 144.5 million barrels, the highest since January 12, 2007. That’s “quite bearish, given that inventories are normally falling at this time of year,” Evans said. Distillate stocks were forecast to fall 1.15 million barrels in the Bloomberg survey. Crude oil supplies have increased as the Organization of Petroleum Exporting Countries agreed on March 15 to keep output quotas unchanged, saying members have to cut a further 800,000 barrels a day to comply with existing targets. OPEC is next scheduled to meet on May 28 in Vienna. OPEC, the International Energy Agency and the U.S. Energy Department cut their 2009 forecast for oil demand this month. They expect consumption to slump by more than 1 million barrels a day this year. “Until we see either a drop in supply or some positive developments on the demand side, prices are going to be under pressure,” said Peter Beutel, president of Cameron Hanover Inc., an energy consulting company in New Canaan, Connecticut. Brent crude oil for May settlement rose 61 cents, or 1.3 percent, yesterday to $48.60 a barrel on London’s ICE Futures Europe exchange. March 31 (Bloomberg) -- Soybean prices soared the most in five months after a government report showed farmers intend to plant fewer acres of the oilseed than analysts expected. Soybean acres will rise 0.4 percent to a record 76.024 million from a year ago, the U.S. Department of Agriculture said today in a report. Analysts in a Bloomberg News survey forecast a 4.5 percent gain. Before today, soybean futures fell 29 percent in the past year as costs for fertilizer, seeds and farm machinery climbed. Soybean futures for May delivery rose 47.5 cents, or 5.3 percent, to $9.52 a bushel on the Chicago Board of Trade. The gain was the biggest for a most-active contract since Oct. 29. This month, soybeans climbed 9.2 percent. In the quarter, the price declined 2.9 percent, the third straight drop. Futures rose today as farmers said they intend to plant fewer peanuts, sunflowers and canola. “Plantings of other U.S. oilseeds were down, so this is constructive” for price gains, Anne Frick, a senior oilseed analyst at Prudential Financial, said in a report. The estimated reductions were 27 percent for peanuts, 18 percent for sunflowers and 15 percent for canola, the USDA said. U.S. farmers said they intend to reduce acreage this year on the 13 major crops by 3.5 percent to 250.54 million, the lowest since 2006, USDA data show. “The increased input costs will cause farmers to let less- productive land lie fallow,” said Dan Cekander, a senior market analyst at Newedge USA LLC in Chicago. A rally of an additional 50 cents to $1 may spur growers to add acres, he said. Soybean inventories on March 1 fell to the lowest since 2003 as China, the world’s biggest oilseed importer, increased purchases from the U.S., Frick of Prudential said. About 1.302 billion bushels were in storage, down 9.2 percent from a year ago, USDA data show. Analysts expected 1.327 billion. The increased demand implies U.S. reserves before the harvest will fall to 180 million bushels from 185 million estimated earlier this month by the USDA, Frick said. April 1 (Bloomberg) -- The yen strengthened on speculation President Barack Obama will let U.S. automakers go bankrupt, reviving demand for the Japanese currency as a refuge from the global financial crisis. The yen climbed versus all of the 16 most-active currencies after people familiar with the matter said Obama has determined a prepackaged bankruptcy is the best option for General Motors Corp. and is prepared to allow Chrysler LLC to go bankrupt. The yen advanced to 98.67 versus the dollar as of 9:19 a.m. in Tokyo, from as low as 99.47 earlier and from 98.96 yesterday in New York. Japan’s currency strengthened to 130.43 per euro from as low as 131.89 earlier and from 131.13. The dollar traded at $1.3241 versus the euro from $1.3250. The yen earlier weakened after a central bank survey showed Japan’s business confidence dropped the most on record. The Bank of Japan’s Tankan survey of sentiment among large manufacturers dropped to minus 58 in March from minus 24 in December, the central bank said today in Tokyo. Economists expected a decline to minus 55, according to a Bloomberg survey. Japan’s currency tumbled 8.4 percent against the dollar in the first quarter, the worst performance since the last three months of 2001, and weakened 3.5 percent versus the euro, the first quarterly drop since June. Factory output declined 9.4 percent in February, the fifth month of declines, the Trade Ministry said March 30. The jobless rate rose to 4.4 percent and household spending plunged 3.5 percent in February, the statistics bureau said yesterday. FKLI March futures contract rebound 4 points higher to close at 871 as compare to previous trading session with total 3595 lots traded in the market. FKLI mainly traded sideways during entire trading session as market need fresh leads to lead FKLI towards certain direction. FCPO 3rd month June Futures contract rose RM30 higher to close at RM2000 as compare to previous trading session with 5251 lots traded in the market. CPO price seems mainly traded sideways during trading session despite crude oil and soybean oil was traded wild during trading session. 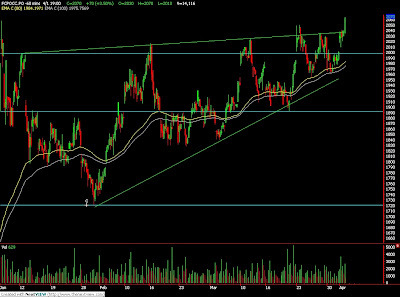 Technically, CPO price seems still holding firm above support levels at RM1950 and RM1970 regions. We expect CPO price would encounter great selling pressure around resistance levels at RM2035 and RM2050 regions. Traders were advice to hold short position provided resistance levels were not violated. Supports were seen at RM1950 and RM1920 regions. March 31 (Bloomberg) -- Oil rose, set for the biggest monthly gain since June, on speculation governments’ widening stimulus plans will boost the global economy and fuel demand. Crude gained as much as 1.7 percent to $49.24 a barrel on the New York Mercantile Exchange, rebounding after a slump in U.S. stocks prompted the biggest drop in four weeks yesterday. Oil has risen 9.9 percent this month after U.S. Treasury Secretary Timothy Geithner unveiled a plan to remove toxic assets from banks. “There are expectations that later in the year we are likely to see some of these efforts working,” said Victor Shum, a senior principal at consultants Purvin & Gertz Inc. in Singapore. This will “thereby improve the global economy and have a positive impact on demand,” he said. Crude oil for May delivery was at $49.17 a barrel at 11:42 a.m. Singapore time. Yesterday, it fell $3.97, or 7.6 percent, to $48.41 a barrel, the lowest settlement on the Nymex since March 18 and the biggest decline since March 2. Crude has gained 10 percent this quarter after tumbling 56 percent in the previous three months. This month’s gain was the biggest since a 9.93 percent jump in June. Oil dropped yesterday after President Barack Obama said that General Motors Corp. and Chrysler LLC have one last chance to “fundamentally restructure.” GM plunged as much as 34 percent as the company’s recovery plan was rejected by the government and Chief Executive Officer Rick Wagoner was forced to resign. U.S. stocks slumped the most in three weeks yesterday on the warning to automakers and because the administration said that some banks will need more government aid. The Standard & Poor’s 500 Index declined 3.5 percent to 787.53. The Dow Jones Industrial Average fell 254.16, or 3.3 percent, to 7,522.02. It was down more than 300 points when oil floor trading ended. Dow futures expiring in June rose 0.2 percent to 7,494 at 9:14 a.m. Sydney time. S&P futures added 1.90, or 0.2 percent, to 786.20. The euro fell against the dollar for a fourth day. The dollar strengthened 0.1 percent to $1.3189 per euro from $1.3199. A stronger dollar reduces the appeal of commodities and oil for investors as a hedge against inflation. Copper has dropped 54 percent in the past year as the financial turmoil, slumping auto and housing markets and rising unemployment curbed economic growth. Gold gained, headed for its best quarter in a year, on increased demand for the precious metal as a store of value and hedge against accelerating prices as central banks boost spending to fight the global recession. The Reuters/Jefferies CRB Index of 19 commodities fell 7.09 points, or 3.2 percent, yesterday to 215.17, the biggest one-day drop since March 2. U.S. crude oil stockpiles surged 3.3 million barrels to 356.6 million barrels in the week ended March 20, the highest since July 1993 and 13 percent more than average for this time of year, according to an Energy Department report on March 25. Supplies probably rose 3.5 million barrels last week, according to the median of nine responses in a Bloomberg News survey. Brent crude oil for May settlement rose as much as 91 cents, or 1.9 percent, to $48.90 a barrel on London’s ICE Futures Europe exchange. It was at $48.83 a barrel at 11:37 a.m. Singapore time. It fell $3.99, or 7.7 percent, yesterday to end the session at $47.99 a barrel. The contract touched $47.66, the lowest since March 18. March 31 (Bloomberg) -- Crude oil rose for the first day in three, as U.S. equities erased some of their losses after the close of floor trading yesterday, and stock futures advanced. Oil is poised for its best-performing first quarter in three years and its first positive quarter since the second three months of 2008. Prices fell the most in four weeks yesterday as tumbling equity markets signaled that the recession in major energy-consuming countries may deepen, curbing fuel use. Crude oil for May delivery rose 25 cents, or 0.5 percent, to $48.66 a barrel at 9:28 a.m. Sydney time on the New York Mercantile Exchange. Yesterday, it fell $3.97, or 7.6 percent, to $48.41 a barrel, the lowest settlement on the Nymex since March 18. It was the biggest decline since March 2. Prices are up 9.1 percent this year. Dow futures expiring in June rose 14 to 7,494 at 9:14 a.m. Sydney time. S&P futures added 1.90, or 0.2 percent, to 786.20. The euro fell against the dollar for a fourth day. The dollar strengthened 0.1 percent to $1.3189 per euro from $1.3199. “The stronger dollar and falling equities are a recipe for lower prices,” said Nauman Barakat, senior vice president of global energy futures at Macquarie Futures USA Inc. in New York. The Organization of Petroleum Exporting Countries will watch for improvement in the global economy when it meets May 28 to decide whether more oil needs to be removed from the market, Iran’s OPEC governor said. The group agreed on March 15 to keep output quotas unchanged, saying members have to cut a further 800,000 barrels a day to comply with existing targets. Brent crude oil for May settlement fell $3.99, or 7.7 percent, yesterday to end the session at $47.99 a barrel on London’s ICE Futures Europe exchange. Brent touched $47.66, the lowest since March 18. March 30 (Bloomberg) -- The pound fell against the dollar for a fourth day and gilts rose as equities dropped and an industry group said financial-services companies may eliminate as many as 15,000 jobs in the second quarter. Sterling slipped to its lowest level in almost two weeks as leaders of advanced and emerging economies prepared to meet to discuss a global approach to financial regulation at the Group of 20 summit in London on April 2. Today’s drop versus the dollar put the pound on course for its third straight quarterly loss, the longest stretch of declines since December 2005. Sterling dropped 1 percent to $1.4182 at 5:40 p.m. in London, after slumping to $1.4111, bringing its decline since the end of December to 3 percent. The British currency strengthened 0.1 percent to 92.68 pence per euro. The pound may drop to $1.36 this week, Stannard said. Stock markets in Europe, the U.S. and Asia retreated. The U.K.’s benchmark FTSE 100 Index declined 3 percent as Barclays Plc slid as much as 15 percent after Societe Generale SA said the government may end up owning as much as 67 percent of the lender and recommended selling the shares. HSBC Holdings Plc lost as much as 8.8 percent. U.K. financial-services companies may cut 1.4 percent of the industry’s workforce in the second quarter as business confidence declines, the Confederation of British Industry said today in a report based on a quarterly survey of financial companies. U.S. Treasury Secretary Timothy Geithner said yesterday on the ABC News program “This Week” that some financial firms will need “large amounts” of government aid. Government bonds gained as the Bank of England bought 2.5 billion pounds ($3.5 billion) of gilts today as part of its quantitative-easing plan to reduce borrowing costs and revive the economy. Sellers offered 5.1 billion pounds of bonds, making a bid- to-cover ratio of 2.03, the U.K. central bank said in a statement today. Last week’s ratios were 1.4 on March 25 and 3.21 on March 23. The yield on the 10-year gilt fell 11 basis points to 3.18 percent. The 4.5 percent security due in March 2019 gained 0.95, or 9.5 pounds per 1,000-pound face amount, to 111.20. The two- year note yield decreased 11 basis points to 1.17 percent. Bond yields move inversely to prices. The U.K. government plans to sell 3.5 billion pounds ($5 billion) of notes due in 2015 on April 1 and 2.25 billion pounds ($3.2 billion) of 30-year bonds on April 2. The Treasury suffered its first failed auction in seven years last week as investors bid for less than the 1.75 billion pounds of 40-year securities offered by the Debt Management Office. “We’ll be watching closely this week to see whether that was a one-off event or the start of a strike by gilt investors,” Stamenkovic said. March 31 (Bloomberg) -- The yen traded near a two-week high against the euro after Standard & Poor’s cut Ireland’s AAA credit rating, the fourth downgrade of a euro-region government this year. Japan’s currency and the dollar may extend this week’s gains against the euro after a U.S. government official said bankruptcy may be the best option for General Motors Corp., causing the biggest slump in stocks in three weeks. The euro also weakened versus nine of the 16 major currencies after the World Bank forecast Russia’s economy will probably shrink 4.5 percent this year. The yen traded at 128.43 per euro at 8:44 a.m. in Tokyo, from 128.36 yesterday in New York when it touched 126.42, the strongest level since March 16. Japan’s currency was at 97.40 versus the dollar from 97.26. The dollar traded at $1.3188 per euro from $1.3199. The dollar is headed for a 5.6 percent gain against the euro in the first three months of the year, its fourth consecutive quarterly increase. The yen lost 1.4 percent versus the euro, the first quarterly loss since June. The greenback rose 7.5 percent this quarter against the yen, the second-best performance among major currencies tracked by Bloomberg. The dollar strengthened this quarter as some investors took refuge in the greenback as the world’s reserve currency. Others sought shelter in the yen as Japan’s trade surplus makes the currency attractive to investors in times of turmoil, as it means the country doesn’t rely on overseas lenders. Europe’s single currency fell yesterday as S&P cut Ireland’s rating after slashing its rating on Hungary’s foreign debt. Hungary’s forint yesterday declined to as low as 313.25 per euro, the weakest level in three weeks. Any gains in the yen may be tempered after a government report showed the nation’s unemployment rate climbed to a three- year high. Japan’s jobless rate increased to 4.4 percent in February, from 4.1 percent the previous month, the statistics bureau said today in Tokyo. FKLI March futures contract plunge 20 points lower to close at 867 as compare to previous trading session with total 8233 lots traded in the market. World Indices traded lower due to release regarding GM in states might encounter great financial difficulties. Technically, FKLI plunge after support trend line at 883 regions but manage to temporary hold above 38.1% Fibonacci projection levels at 864 regions. 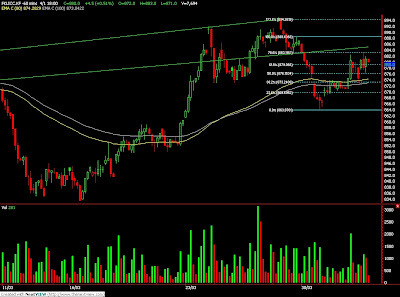 We expect FKLI would trade lower in the coming trading session where support levels were seen at 845 and 830 regions. 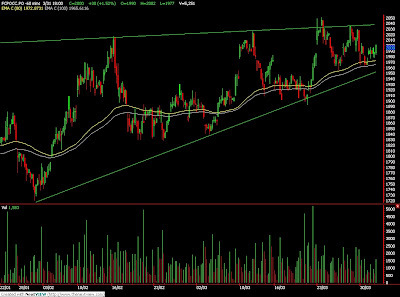 Traders were advice to hold short position in the coming trading session while be extra cautious around resistance levels at 879 and 888.5 regions. FCPO 3rd month June Futures contract fall mildly RM20 lower to close at RM1970 as compare to previous trading session with 5900 lots traded in the market. CPO price was seen holding during the trading session despite crude oil and soybean oil plunge during electronic trading session. Technically, CPO price seems holding well above 80 – day and 100 – day moving average in the hourly price chart. We expect CPO price still traded sideways within the rising wedge in the hourly price where critical resistance levels seen at RM1990 and RM2035 region. Traders were advice to hold short position in the coming trading session if support levels at RM1950 and RM1890 were violated; provided resistance levels were not violated. March 30 (Bloomberg) -- The yen and the dollar rose against the euro after an Obama administration official said bankruptcy may be the best option for General Motors Corp. and Chrysler LLC, spurring investors to seek the shelter of the two currencies. The yen extended gains versus all 16 major currencies as Asian stocks ended a five-day rally on concern the global recession will lead to further losses in the financial industry. The greenback advanced for a third day versus the euro on speculation the European Central Bank will cut interest rates this week to the least since the European currency was introduced in 1999. The yen advanced to 128.25 per euro as of 6:58 a.m. in London from 130.04 in New York last week. The dollar rose to $1.3214 per euro from $1.3287. The greenback climbed to $1.4206 per British pound from $1.4320. Japan’s currency gained to 96.96 per dollar from 97.86. The Dollar Index rose for a third day after the Obama administration official, who declined to be identified, said the automakers must overhaul their recovery plans with deeper concessions to justify further aid from U.S. taxpayers. GM asked for as much as $16.6 billion in additional assistance after receiving $13.4 billion since December. Chrysler requested $5 billion after getting $4 billion. Both had been asked to show progress by the end of this month in matters such as GM’s need to cut its unsecured debt by two-thirds. The Dollar Index, which the ICE uses to track the greenback against the euro, yen, pound, Canadian dollar, Swiss franc and Swedish krona, climbed 0.5 percent to 85.538 after reaching 85.608, the highest level since March 18. The yen strengthened as the MSCI Asia Pacific Index slumped 3.6 percent, its biggest loss in more than two months. Futures on the Standard & Poor’s 500 Index dropped 1.9 percent. The euro weakened for a second day versus the yen on expectations ECB President Jean-Claude Trichet will signal further interest rate-cuts when he speaks before the Committee on Economic and Monetary Affairs today. Trichet speaks at 4:30 p.m. in Brussels. The central bank is likely to reduce interest rates to 1 percent at its meeting on April 2, according to a Bloomberg News survey of economists. The 16-nation currency declined amid speculation leaders from the Group of 20 nations, who meet on April 2 in London, will fail to agree on fiscal measures to counter the slump. European officials earlier this month said they had spent enough money to combat the financial crisis and don’t want to blow out their budgets. March 30 (Bloomberg) -- The yen declined, poised for the worst quarter versus the dollar since 2001, after a government report today showed Japan’s industrial production shrank for a fifth month. Demand for the Japanese currency also waned before the Bank of Japan’s Tankan survey on April 1 that may indicate sentiment among the nation’s largest manufacturers slumped to the lowest level in more than 30 years. The euro traded near the lowest in almost two weeks against the dollar on speculation the European Central Bank will this week cut interest rates to the least since the introduction of the 16-nation currency in 1999. The yen weakened to 98.11 per dollar as of 8:51 a.m. in Tokyo from 97.86 in New York on March 27. It has fallen 8.6 percent this quarter, the largest decline since a 9.2 percent drop in December 2001. Japan’s currency was at 130.12 per euro from 130.04 last week. The European currency traded at $1.3262 from $1.3287. Japan’s yen fell against 11 of the 16 major currencies after the trade ministry said industrial production fell 9.4 percent in February, more than the 9.1 percent decline forecast by economists. The Tankan index slid to minus 55 this quarter from minus 24 in December, according to a Bloomberg survey before the April 1 data. That would be the lowest since 1975 and the biggest drop since the bank started the survey. A negative number means pessimists outnumber optimists. The euro may fall for a third day against the dollar as investors increased bets the ECB will cut interest rates on April 2. The yield on the three-month Euribor interest-rate futures contract due June declined to 1.3 percent on March 27, the lowest level since at least December 1998, according to data compiled by Bloomberg. March 30 (Bloomberg) -- Crude oil fell for a second day in New York on speculation high global stockpiles will persist as the world economy remains in recession. Factory output in Japan, the world’s third-largest oil consumer, dropped for a fifth month in January, its longest losing streak since 2001, according to a Trade Ministry report today. Global demand remains weak and oil is unlikely to reach $60 this year, Qatar’s Oil Minister Abdullah Bin Hamad Al- Attiyah said. Crude oil for May delivery fell as much as $1.26, or 2.4 percent, to $51.12 a barrel in after-hours electronic trading on the New York Mercantile Exchange. It was at $51.59 at 8:33 a.m. Singapore time. The contract declined 3.6 percent to $52.38 a barrel on March 27 as signs of a deepening recession in Europe depressed equity markets and lifted the dollar, reducing the appeal of commodities. Oil gained 0.6 percent last week. New York oil futures gained 16 percent this month as a slump in the U.S. dollar made commodities cheaper for buyers spending other currencies and increased investor demand for a hedge against inflation. In the same period, oil stockpiles in the U.S., the world’s largest consumer, rose 1.7 percent. Inventories reached 356.6 million barrels on March 20, the highest in more than 15 years and 13 percent more than average for the time of year, according to Energy Department records. Recent oil price gains were driven by the dollar, not improved supply and demand, Al-Attiyah said in an interview in Kuwait yesterday. The U.S. dollar climbed to $1.3204 against the euro today, the highest since March 19. It last traded at $1.3263, from $1.3292 late in New York on March 27. Brent crude oil for May settlement fell as much as 98 cents, or 1.9 percent, to $51 a barrel on London’s ICE Futures Europe exchange, and was trading at $51.25 at 8:28 a.m. in Singapore. It dropped 2.8 percent to $51.98 on March 27. Current prices are “reasonably fair” and there is no indication the market is expecting another round of output cuts by the Organization of Petroleum Exporting Countries, Commodity Warrants’ Hassall said. OPEC produces about 40 percent of the world’s oil and has agreed to cut daily output by 4.2 million barrels since September. It left targets unchanged this month and will review them again May 28. The cuts, 79 percent achieved to date, have been “very important” in helping stabilize oil prices, OPEC president Jose Maria Botelho de Vasconcelos said in Brazzaville on March 28. Member states must get to full compliance and further cuts may yet be necessary, he told a conference of African oil producers.